The use of iSeismometer has been discussed in a couple medical articles as an inexpensive guide in diagnostics. And now we have some feedback and practical thoughts from the OT community. 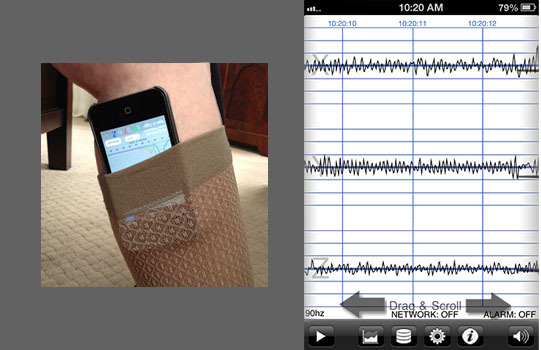 Continue to read further in this discussion about newer smartphone applications such as Lift Pulse which was created specifically for recording tremors and has an easier interface. I decided to test the iSensometer with my ET. Holding my iphone in each hand It came up perfectly with a tremor of about 6Hz on several tries. OK, I assumed that it works. Next I held it to my leg. Problem. I kept comming up with 6Hz not the 14 to 15 Hz expected. In a side email JoanC said try straping the iphone to my leg. Take my hands off it as it is probably primarily picking up my ET tremors from my hand. any thoughts or other tips? Joan and Dwight - very interesting! When I went in for my appointment with Dr Torres he put his phone up to my leg. He recorded the sound that my leg made. He replayed it for me and it sounded like a helicopter as it is flying away. He was very happily surprised that he could hear my tremor, as was I. So in order to test the experiment he had his assistant do the same with his phone. The same thing happened. Not sure what it all means but it was really interesting to "hear" the tremor. Another free iPhone app, Lift Pulse with a much simpler user interface. This was developed for recording tremors. The primary use of the iSeiso app was for earthquake and similar events. The initial use of Lift Pulse was directed towards Essential tremor and Parkinson's, but strapping an iPhone onto your legs or effected area should have the same results as it being handheld. There are many premade straps available for iPhones that have been made for people that run with their phones and listen music, or I'm sure that you could devise something similar with a piece of cloth, velcro, or plastic wrap? Below is a screen shot of the app when it starts, hold the phone, or strap it to your leg and press record. It takes a 10 second recording and then shows the results. It's very easy to use. **I received an email from Lift Lab Design, the developer of the LiftPulse application, and in the future they will be increasing the scale to 20Hz to incorporate the range potential of OT. Thank you! I just signed on to check for new posts and found this! I was truly amazed to read our tremors can be recorded on a Smartphone! We don't have one, but may be forced to get one at this point. Thanks so much for the information; I will be checking frequently for more updates. I wonder if the SmartPhone might eventually help in earlier diagnosis, especially since this is an easily accessible device. I remember back in 2000 after much searching for a diagnosis, as part of the examining procedure my neurologist put her stethoscope to the hardening calf of my leg as I stood before her. What she heard was the classic sound of the helicopter, her eyes told me she knew what I had however sent me to the lab for an EMG for confirmation. A long time since I have written on site, but this article will really excite my grown grand children. There will be a wild time comparing all 10 to 12 smart phone on Nana's legs. I do remember reading "Keep On Keeping On" 9 years ago, good to hear from you Virginia. Sounds like you could have fun with all of your grand-children "researchers" ! We only had a couple minutes to play with the iSeismometer app and didn't capture the final screen, but the screen below shows approximately 17-18 Hz (waves or cycles between the 1 second vertical demarcation). If we find some time in the future it would be good to work with this setup a little more and possibly post a mini-tutorial on using this application. If anyone else gives this a try and has some additional feedback please post your findings. And as soon as the LiftPulse application includes the ability to record up to 20Hz, we will try to post results from this too. 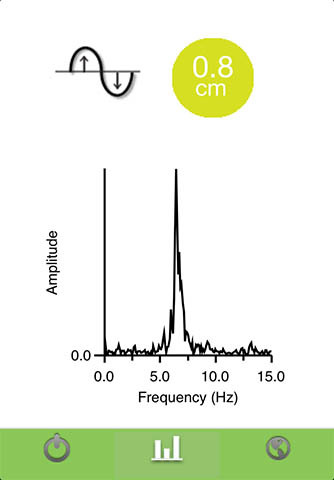 method than commercial accelerometers or EMG analysis. obtaining important on the-go reference information. I am so intrigued with what I have been reading regarding being able to "hear" our tremors via either a Smartphone or iPhone. As I mentioned earlier, we don't have one, but may have to get one just to be able to "hear" my tremors. Since I am not that tech savvy, does one need an app in order to be able to use the phone in this way? I too, remember the first time I read a post from Virginia; always signing off with "Keep on keeping on". We have been in touch through the years and we have been on this site about the same amount of time. I remember when I first found this site....I was thrilled. I think it was right after it was it was put on the Internet. Jeff, you had a different format at that time, and my goodness, what a change through the years. You have done a wonderful job of keeping things in good order and keeping all of us connected. I look forward to reading more about "hearing" our tremors. Unfortunately or fortunately these little smartphones are embedded in our lives. Apps are little applications, similar to running a program like a word processor on your computer. Apps, can be free or cost a couple dollars and downloaded to your phone. Maybe you can convince a friend with an iPhone to download one of the apps and try it. iSeismometer is currently free, and the other product LiftPulse is too (although you will need to wait until they make some changes to accomodate the OT tremor. Thank you so much for the information regarding "apps". It seems everyone has a smartphone, but we haven't upgraded; we still have a plain cell phone. I will try to find someone who has an iPhone who might download the app so I/we can hear my tremors. It certainly would be helpful when trying to explain what is going on with us. This is very exciting to read and to know there is another tool out there to help us explain OT....and perhaps help neurologists better understand our problem. I will try to find someone who has an iPhone who might download the app so I/we can hear my tremors. 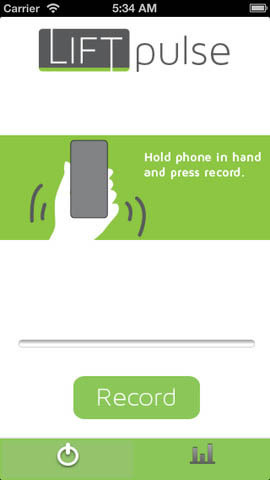 The app described above will present a visual chart of the phone being moved by the tremor. I don't have any specific information on the technique that Dr Torres-Russotto used to hear the tremor. In the chart, one cycle would be from one peak to the next. The frequency (Hertz) which is "how fast", is the number of cycles within a second. So if the muscle is contracting and relaxing 13-18 times per second (typical OT) that is pretty darn fast. I am still so excited to learn of this way to hear/see our tremors. I remember when I was tested by Dr. Seth Pullman in New York in 2002; he had me hooked up to all kinds of machines and I could see my tremors at that time, but didn't hear them. I have all those graphs, but no one can truly understand what is going on unless they experience it ~ or might be able to hear/see them. Mine were determined to be about 18 hertz per second; so I guess that was pretty fast then and seems to be even more pronounced at this point. I am beginning to feel we must get an iPhone so I can have it when I try to explain what is going on with me. As I said....this is VERY exciting news to me and I appreciate the graphs and information you have added to this site. I know when you have more information, you will add it as well. Thanks again; and keep up the good work.